SC Works Catawba sponsored its first Sector Job Fair on June 14, 2016 at USCL. The focus of the job fair was Light Industrial/Manufacturing. The 14 Catawba Area Employers in attendance, were all recruiting for positions in the Light Industrial/Manufacturing Field. The idea behind conducting a Sector Focused Job Fair was to coordinate the needs of the employer with the skills of the job seeker. Employers were able to briefly speak with and take resumes/applications of job seekers with Light Industrial/ Manufacturing Experience and/or interest. In turn, the job seeker had an opportunity to market themselves to employers that matched their skillset and interest. A Win-Win for both the employer and job seeker. Another new feature of the job fair, included the presence of eleven SC Works Partners. The Partner Agencies were there to talk with job seekers and share information on their particular services. This partnership is the new direction led by the implementation of WIOA. 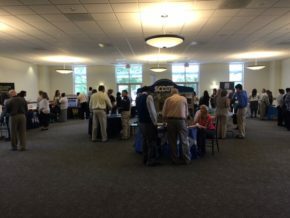 The demographics of the 217 attendees were a combination of residents from all three counties in the Catawba Region, Veterans from all branches of the military, varying education levels (including 74 participants already having their Work Keys scores) and 44 job seekers opting to participate in the “Preferred Pass” pre-job fair workshop. By attending the preparation class, they earned the opportunity to enter the job fair one hour before the general public. The positive feedback from all of the participating parties was so overwhelming that SC Works Catawba plans to sponsor sector specific job fairs each quarter, alternating locations between the three counties in the Catawba Region – Chester, Lancaster, and York.